ShinePro® Maintenance Pads are high quality diamond-impregnated pads available in 7, 8, 9, 13, 14, 16, 17, 20, 21, and 27 inch sizes for use with LAVINA® machines, swing machines, burnishers, and auto scrubbers. The first of their kind for the LAVINA® line, they provide the perfect solution for floor maintenance. ShinePro® pads can be used wet or dry, do not require wax or chemicals, and are a very environmentally friendly solution for maintaining floors. ShinePro® are safe for daily use. 220 Grit ShinePro® Pads will provide an aggressive cleaning cut for the first step on extremely dirty floors. 400 Grit ShinePro® Pads will provide a honing cut for the second step on already clean floors. 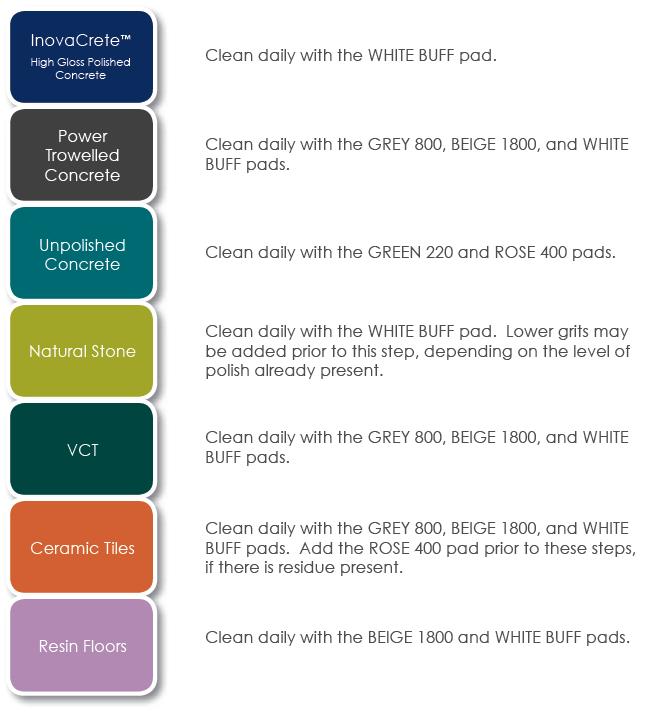 800 Grit ShinePro® Pads will provide a finished polished look to a surface that is already honed properly. 1800 Grit ShinePro® Pads will provide a more deeply finished polished look to a surface that is already honed and polished properly. Buff Grit ShinePro® Pads will provide the finishing touch to a properly polished surface. Buff Grit ShinePro® Pads can also be used for burnishing guard and sealer products. Please refer to the chemical manufacturers’ instructions for their recommended system when chemicals are used. Follow the guide to the left for specific floor recommendations. ShinePro® pads may be used dry, but wet use is highly recommended. If wet, use with water or a pH neutral cleaning solution designed for floor maintenance. All water and residue should be reclaimed from the floor after cleaning. If using a cleaning solution, carefully follow the manufacturer’s directions and apply no more than the amount suggested. It is very important that operators not over apply cleaners to the floor, as this can leave behind residue and interfere with the floor’s natural shine. To maintain concrete or natural stone floors with minor scratching or etching, begin with one grit lower than the recommendation to the left, and continue as suggested. For floors requiring only two maintenance steps, operators may rotate these two steps daily; i.e., run BEIGE 1800 one night, WHITE BUFF the following night, and repeat. ShinePro Pads are sold in boxes of 5 pads. Click the button below to add the ShinePro® Maintenance Pads to your wish list.